This animated feature was released in February 2011. It was a big hit all over the world, grossing $200 million. 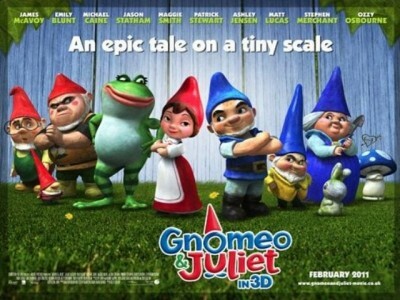 The movie tells the story of Gnomeo and Juliet, a pair of garden ornaments who are strikingly similar to Shakespeare’s Romeo and Juliet. But rather than being a tragedy, it’s a big comedy romp. The voice cast includes Emily Blunt, Jason McAvoy, Michael Caine, Jason Statham, Matt Lucas, Stephen Merchant and Ashley Jensen. the score features the music of Elton John – who was also one of the executive producers.